Gregory Heuer, MD, PhD, is an attending neurosurgeon in the Division of Neurosurgery at Children's Hospital of Philadelphia. Dr. Gregory Heuer was born and raised in Prior Lake, Minnesota. He studied Genetics and Cell Biology at the University of Minnesota and then received his MD and PhD from the Perelman School of Medicine at the University of Pennsylvania. Dr. Heuer completed his neurosurgery residency at the Hospital of the University of Pennsylvania and his fellowship training in pediatric neurosurgery at the Children's Hospital of Philadelphia. 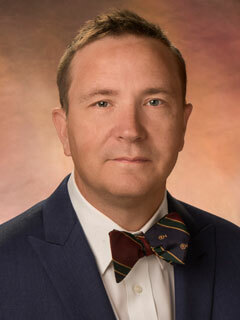 He currently serves as an Assistant Professor in the Division of Neurosurgery. Clinically, Dr. Heuer has a broad interest in all areas of pediatric neurosurgery, including surgery for brain and spine tumors, congenital spinal disorders, hydrocephalus and complex spinal deformity. Dr. Heuer works closely with a team of neurologists in the Pediatric Regional Epilepsy Program to treat children with seizure disorders. Dr. Heuer collaborates with the Center for Fetal Diagnosis and Treatment, aiming to improve outcomes of children suffering from conditions discovered before birth. These conditions include hydrocephalus, lipomyelomeingoceles, meningoceles, and myelomeningoceles. Dr. Heuer has a particular interest and specialization in restoring function in children with neurologic disease. This includes peripheral nerve repair and regeneration for patients with tumors or traumatic injuries to the brachial and lumbosacral plexuses. Additionally, Dr. Heuer is interested in the application of functional neurosurgery, such as deep brain stimulation and baclofen pump placement, for patients with spasticity, movement disorders, and epilepsy. Dr. Heuer’s research efforts focus on the implementation of implantable devices and novel molecular based treatment strategies to restore function to the brain and spine in children. He also has interest on research for the diagnosis and treatment of neurologic disease in children before birth. When not at work, Dr. Heuer’s primary focus is his family, including his wife and daughter. Heuer GG, Madsen PJ, Flanders TM, Kennedy BC, Storm PB, Taylor JA. Separation of Craniopagus Twins by a Multidisciplinary Team. N Engl J Med. 2019 Jan 24;380(4):358-364. doi: 10.1056/NEJMoa1805132. Pisapia JM, Rozycki M, Akbari H, Bakas S, Thawani JP, Moldenhauer JS, Storm PB, Zarnow DM, Davatzikos C, Heuer GG. Correlations of atrial diameter and frontooccipital horn ratio with ventricle size in fetal ventriculomegaly. J Neurosurg Pediatr. 2017 Mar;19(3):300-306. Heuer GG, Adzick NS, Sutton LN. Fetal myelomeningocele closure: technical considerations. Fetal Diagn Ther. 2015 Apr;37(3):166-71. Lang SS, Goldberg E, Zarnow D, Johnson MP, Storm PB, Heuer GG. Prenatal diagnosis of hemimegalencephaly. World Neurosurg. 2014 Jul-Aug;82(1-2):241.e5-8. Heuer GG, Storm PB. Head trauma. In: Mattei PA, editor. Fundamentals of Pediatric Surgery. 2nd edition. New York: Springer; 2011. Heuer GG, Storm PB. Ventricular shunts for hydrocephalus. In: Mattei PA, editor. Fundamentals of Pediatric Surgery. 2nd edition. New York:Springer; 2011. Jacob A, Heuer GG, Grady MS. Initial resuscitation, pre-hospital care, and emergency room care of traumatic brain injury. In: Winn HR, editor. Youmans Neurological Surgery. 6th edition. Philadelphia: W.B. Saunders Company; 2011. Heuer GG, Crino P. Malformations of cortical development. In: Winn HR, editor. Youmans Neurological Surgery. 6th edition. Philadelphia: W.B. Saunders Company; 2011. Heuer GG, Lawton M, Winn HR, LeRoux PD. Surgical approaches to intracranial aneurysms. In: Winn HR, editor. Youmans Neurological Surgery. 6th edition. Philadelphia: W.B. Saunders Company; 2011. Heuer GG, Storm PB. Non-communicating hydrocephalus: ventriculoperitoneal shunting. In: Jallo G, Kothbauer KF, Pradilla G, editors. Controversies in pediatric neurosurgery. 1st edition. New York: Thieme; 2010. Heuer GG, Storm PB. Hemispherectomy. In: Baltuch GH, Vellemure JG, editors. Operative Techniques in Epilepsy Surgery. 1st edition. New York: Thieme; 2009. Heuer GG, Bauman J, Storm PB, Baltuch GH. Invasive EEG studies: PEG, strip and grid implantation. In: Baltuch GH, Vellemure JG, editors. Operative Techniques in Epilepsy Surgery. 1st edition. New York: Thieme; 2009. Heuer GG, Stiefel MF, LeRoux PD. Trauma flap/hemicraniectomy. In: Connolly ES, McKhann GM II, Huang J, Choudhri TF, editors. Operative Techniques in Epilepsy Surgery. 1st edition. New York: Thieme; 2009.